"The base is non-skid so your cat can really investigate the ball without the base scooting away." "Older cats will enjoy the paw mode, where the mouse only moves when swiped at." "You can build more than 100 different layouts and buy extra tracks to keep adding." "Uses a safe, low-level automatic laser to entertain your cat and their hunting instincts." "At a perfect height for adult cats, and holds three liters of water." "This toy is ideal for meal time, but can also be filled with treats and left out while owners are away." "Your cat can jump in and out, hide, or just relax on their new favorite rug." "Hold it, swing it, and watch it quickly become your favorite cat’s toy." When your cat needs to scratch, offer up the Bergan Turbo Scratcher Cat Toy, rather than your couch or rug. On the outside of the round scratcher is a track with a ball in it for your cat to explore and move; on the inside is a durable scratch pad. This scratch pad is 16" in diameter and is replaceable. The base is non-skid so your cat can really investigate the ball without the base scooting away. If your older cat has grown lackadaisical, turn on the Hex Bug Mouse Robotic Cat Toy. The small, life-like mouse has soft, grey fur and a tail that wiggles as the mouse moves in random movements, like starting, stopping, and pausing. Plus, the mouse is able to navigate around objects and out of corners (but don’t let it get under your refrigerator). Young, active cats will enjoy the chase mode, while older cats will enjoy the paw mode, where the mouse only moves when swiped at. The small mouse is 1.6" tall and works only on hard surfaces. Batteries are included. Part of their Design Sense Toys line, the Catit Super Roller Play Circuit is an extra large course with a motion-activated light-up ball. Change up the 44" long eight-piece track to keep your can entertained — you can build more than 100 different layouts and buy extra tracks to keep adding. It has high and low sections to get the ball moving, as well as open parts on the sides and on top for active swatting. Overall, the toy promotes exercise and enthusiastic play. Additional add-ons in the Design Sense Toys line by Catit include a food tree maze, a grass planter and an elevated, cushioned bed. If your cat loves to chase a laser pointer, but you can’t always be there to help, use the PetSafe Bolt Interactive Laser Cat Toy. The 8.5-inch tall device uses a safe, low-level automatic laser to entertain your cat and their hunting instincts. Use the automatic mode if you are busy (it shuts off after 15 minutes to avoid overstimulation) or use the manual mode to enjoy the chase. Move the toy around every few days to keep your cat from getting bored, and easily change where the laser points by simply moving the mirror up or down. Batteries (4 AA) not included. If you have a picky drinker or a cat who just loves to splash in the sink, get the Catit Flower Fountain. The 8.6" tall fountain is at a perfect height for adult cats, and holds three liters of water. With a dual-action water softening filter and small pump, your cat will always be getting fresh water. Plus, the filter removes calcium and magnesium and the entire fountain is extremely easy to disassemble and clean or refill. It has three different water flow settings in a cute design. Without the flower attachment, you’ll get a large water surface for drinking; with the white part, your cat can enjoy long streams of water with an exciting bubbling top; with both the white part and the yellow part of the flower, only calm streams of water come out without any bubbling top. The 2.7" tall Food Dispenser Ball from PetSafe is not only a more exciting way to get a meal, but also encourages movement for overweight cats. Simply fill the ball with a portion of dry food (holds up to ⅔ cup) and twist the opening to determine how easy or hard you’d like your cat to work. From there, cats swipe and play with the ball as food rolls out of the opening, a few pieces at a time. This toy is ideal for meal time, but can also be filled with treats and left out while owners are away. Colors include blue, green, orange and pink. The ball is dishwasher safe. For a full body experience, set up the SnugglyCat Ripple Rug. The large rug (47 inches by 35 inches) is made from non-fray and nontoxic ribbed carpet that is stain, mold and mildew resistant. It has a non-slip backing and folds up compactly for storage. The best part about this rug, though? 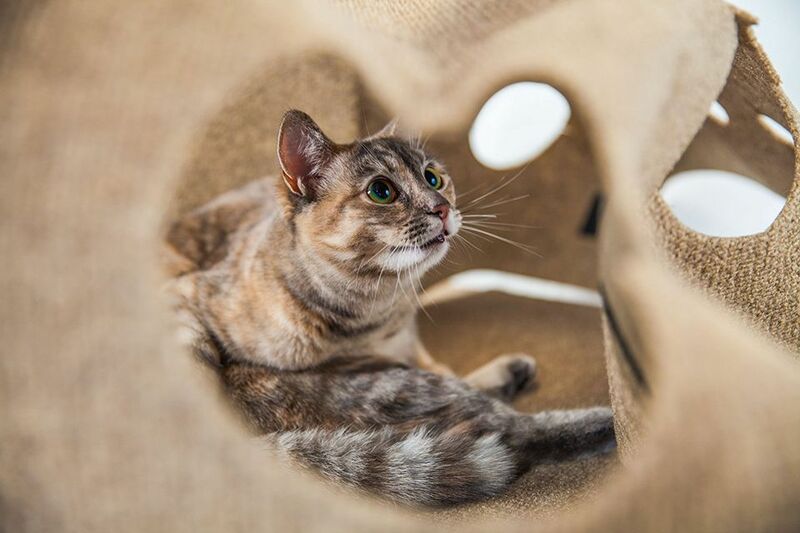 The ripples and hiding spots that you can create for your furry feline. The top layer uses velcro touch points so you can reconfigure the tunnels and waves as many times as you want, and your cat can jump in and out, hide, or just relax on their new favorite rug. The original springy cat toy is still entertaining. The Cat Dancer 101 Interactive Cat Toy uses a wire with a piece of rolled cardboard at the end for endless hours of fun. Hold it, swing it, and watch it quickly become your favorite cat’s toy. And if you are a bit busy, other users recommend attaching it to a wall or on a bookshelf.